Do you know that there is a coin called Toonie? It is Canada 2 dollars bi-metallic circulation coin which bears an image of a polar bear. The name do not came from that polar bear instead come from Canada one dollar coin "loonie". The Loonie name come from The Great Northern Diver (a bird), known in North America as the Common Loon (Gavia immer), is a large member of the loon, or diver, family of birds. The Toonie name come as it is a two dollar coin. "Toonie" is a word combination from the number "two" and the loonie, Canada's one-dollar coin. On the reverse show an image of a polar bear, by Campbellford, Ontario artist Brent Townsend. The obverse has a portrait of Queen Elizabeth II. It is the only coin in Canada to have the "ELIZABETH II / D.G. REGINA" in a different typeface; it is also the only coin to consistently bear its issue date on the obverse. The Canada 2 dollar coin, commonly called Toonie, was introduced on 19 February 1996 by Public Works minister Diane Marleau. The Toonie is a bi-metallic coin and Canada adopted the patented technology to make these coins from Italy. The engineer, and head of the Italian Mint, Dr. Nicola Ielpo, patented the technology of interlocking two metals in coins in 1990. The Toonie, is occasionally spelled "twonie" or "twoonie", but Canadian newspapers and the Royal Canadian Mint use the "toonie" spelling. When the coin was introduced a number of nicknames were suggested. Some of the early ones included the bearie (analogous to the Loonie and its loon), the bearly, the deuce and the doubloonie (a play on "double Loonie" and the former Spanish doubloon coin). The name Toonie became so widely accepted that in 2006 the Royal Canadian Mint secured the rights to it. A competition to name the bear resulted in the name "Churchill", a reference both to the common polar bear sightings in Churchill, Manitoba and Winston Churchill. 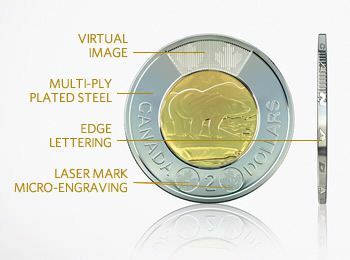 On 10 April 2012, the Royal Canadian Mint announced new design changes to the loonie and toonie, which include new security features. The composition of the inner core switched to aluminium bronze coated with multi-ply plated brass, and the outer ring switched to steel coated with multi-ply plated nickel. The weight dropped from 7.30 to 6.92 grams, and the thickness changed from 1.8 to 1.75 millimetres. Like the new one-dollar circulation coins, Canada's new two-dollar circulation coins are manufactured using the Mint's Multi-Ply Plated Steel technology. The addition of two laser marks of maple leaves, each within a circle, at the bottom of the coin's reverse – i.e. on the side with the Polar Bear design. A virtual image of two maple leaves will appear at the top of the coin – a different image is produced as the coin is turned from side to side. The virtual image is produced by engraving different patterns on each side of two-sided grooves on the face of the coin.